Everyone on the plane died in the crash The numbers vary in the reports I have read to date, so anywhere from 96 to 130 died. It is agreed in all reports there were no survivors. 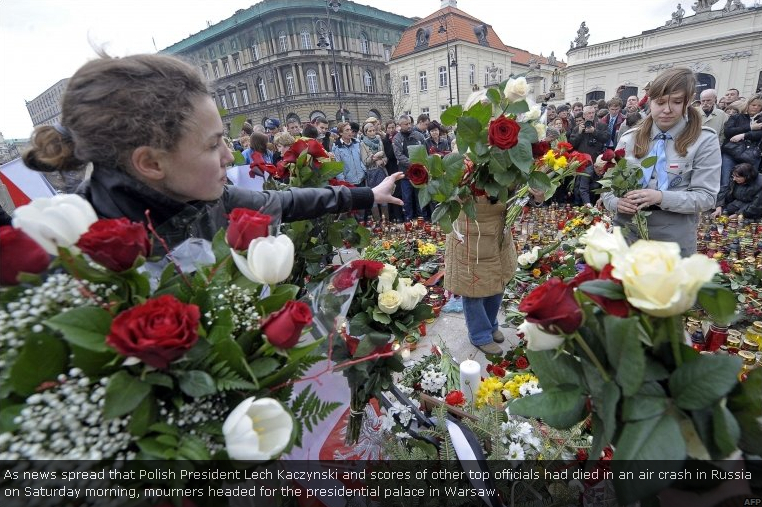 Thousands of Poles have gathered at the presidential palace in Warsaw to mourn Lech Kaczynski, the president, and the 96 others who were killed in an air crash in western Russia. A significant part of Poland’s political establishment was wiped out as all the passengers on board the plane, including senior government officials and parliamentarians, were killed on Saturday. 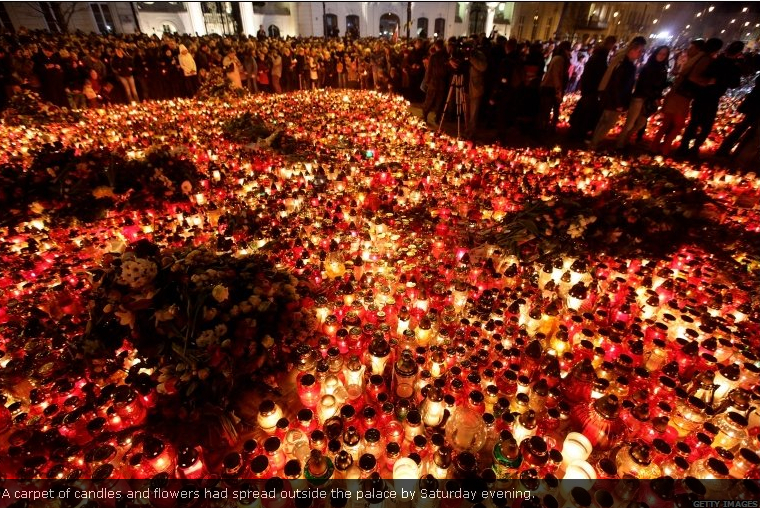 Poles flocked to churches across the nation to lay flowers, light candles, sing hymns and pray. Donald Tusk, the Polish prime minister, described the accident as “the most tragic event of the country’s post-war history”, before flying to the crash site where he and Vladimir Putin, his Russian counterpart, met and laid flowers together. The heads of Poland’s armed forces, the central bank governor, deputy ministers and 15 MPs were among those killed when the jet tried to land in heavy fog and crashed in a forest. Wreckage, including the engines, was scattered across a forest and parts of it burned for more than an hour. The officials had been on their way to the city of Smolensk to take part in reconciliatory ceremonies commemorating the 70th anniversary of the Katyn massacre where Russian forces killed more than 20,000 Polish prisoners of war. 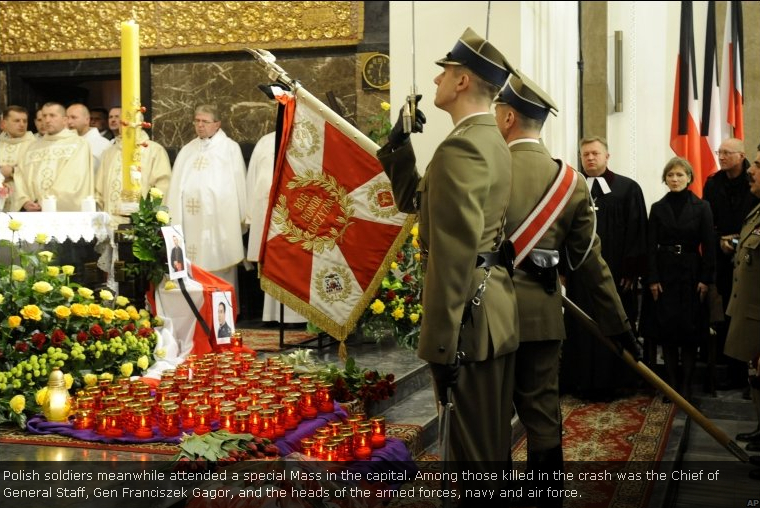 Kaczynski’s wife, Polish church leaders and families of Katyn massacre victims were also killed. Al Jazeera’s Jonah Hull, reporting from Warsaw, said: “Katyn was a major blight between the Soviet Union and Poland for many many years … Thousands of prisoners of war massacred, among them senior officers, troops and also intellectuals – the elite really, who were wiped out effectively in that massacre. Following the constitution, Bronislaw Komorowski, the speaker of the lower house of parliament, took over as interim head of state and a presidential election has to be held before the end of June. Komorowski said he would announce the date of the poll after talks with all political parties. Dmitry Medvedev, the Russian president, has appointed Putin to chair a special commission to investigate the crash. Alexander Alyoshin, the first deputy chief of the Russian air force’s general staff, said the plane’s pilot repeatedly ignored instructions from air traffic controllers. “The head of the air traffic control group gave a command to the crew to put the aircraft into the horizontal position and when the crew did not implement this order, several times gave orders to divert to an alternative airport,” he was quoted as saying by Interfax news agency. Authorities have found both flight recorders, commonly known as “black boxes”, from the jet. 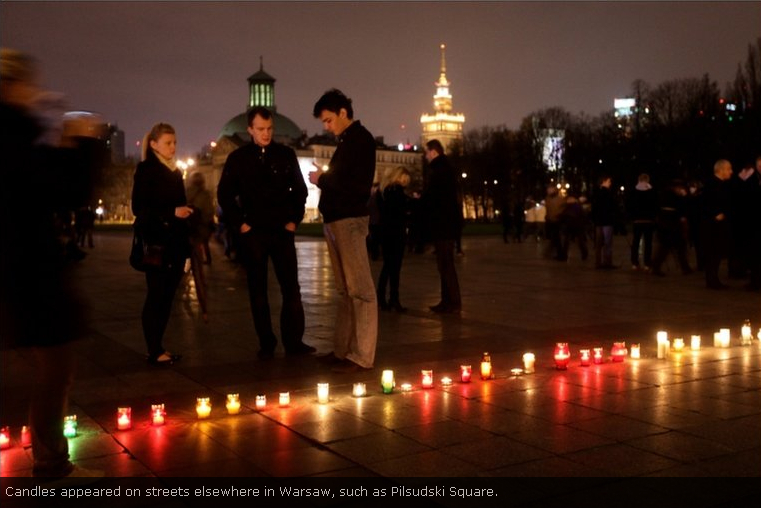 Komorowski, Poland’s acting president, declared a week of mourning after the crash. “We are united – there is no [political] left or right – we are united in national mourning,” he said. Poland had been due to hold a presidential election in October, when Kaczynski was likely to have run against the liberal Komorowski. The conservative Kaczynski, who had served as president of Poland since 2005, had a reputation for being incorruptible and was a popular figure. Marek Matraszek, a political consultant in Warsaw, told Al Jazeera that politically, Kaczynski had been loosing in popularity recently. “But even his deepest enemies would not deny that he was hugely respected by the Polish people,” he said. Matraszek said the loss of so many politicians would have a significant effect on the political scene in Poland. Locals in Smolensk region shared with RT dramatic eyewitness accounts. Both Polish and the Russians will be doing an investigation into the crash. This is a tragic event for all concerned. April 10, 2010 — Russian president Dmitry Medvedev has addressed the Polish nation on the death of their president and expressed his condolences over the tragic events in Smolensk.